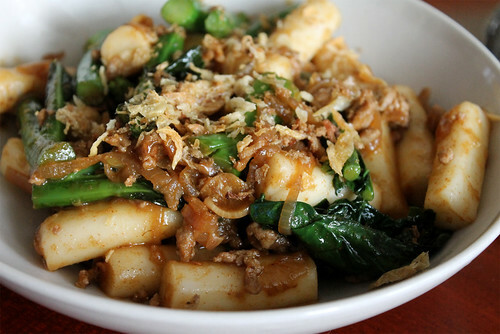 Ddeok, Korean rice cakes, are commonly found in a cheap and popular street snack in South Korea known as ddeokbokki. 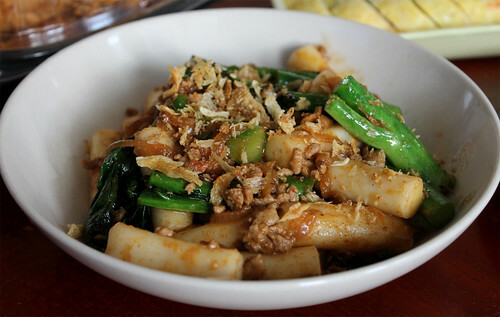 Made from glutinous rice flour, tubular pieces of ddeok float in a red, spicy sauce, either on its own or with vegetables or fried fish cakes. It's a dish that I've tried, and wasn't a big fan of. To me, the dish felt bland because after a few bites, all my mouth could taste (and feel) was heat, heat, and more heat! So when I saw this recipe for Spicy Pork Sausage and Rice Cakes with Chinese Broccoli and Crispy Shallots in the Momofuku cookbook, I was eager to give it a try. And it did not disappoint. The spicy pork sausage is less of a sausage out of a casing, but rather sauteed ground pork with lots of spices and seasonings to make it incredibly flavourful and delicious. Szechuan peppercorns really made this dish sing, while gochujaru gives it a pleasant, spicy kick without being overpowering like ddeokbokki. 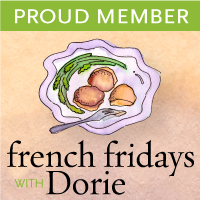 Crispy fried shallots sprinkled on top gives it a light and crunchy texture. The spicy pork sausage sauce is the perfect pairing with the rather plain-tasting ddeok. It's so incredibly savoury and flavourful that I found myself trying to mop up as much sauce as I could with each piece of rice cake and greens. If you own a copy of Momofuku, I highly recommend you try this recipe out. And if you don't, pick up a copy, or borrow one from a friend or your local library. Posted by Bonita at 8:30 a.m.